Grand finale! 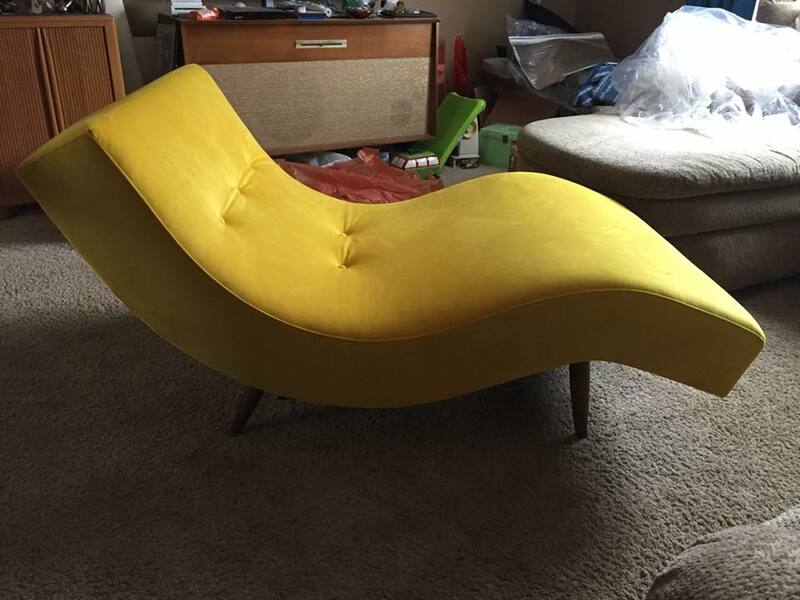 Wave Lounge Restoration Complete! After weeks of coordination, some work on my part and some at the upholsterer, this beautiful piece is now complete and waiting delivery next weekend. I was beyond thrilled when I showed up to pick up at the upholsterer. He did an amazing job! Here are some pics. I arrived at the time we arranged and just in time to watch him close it up. I think he may want me to be there so I could see his work that would shortly be sealed up. You can see his strapping which is all brand new as well as all the foam and stuffing. It is a very firm seat but very comfy and will last another lifetime! I particularly enjoyed his double stitch technique on the seams that create almost a faux piped edge. Super classy without all the piping work! 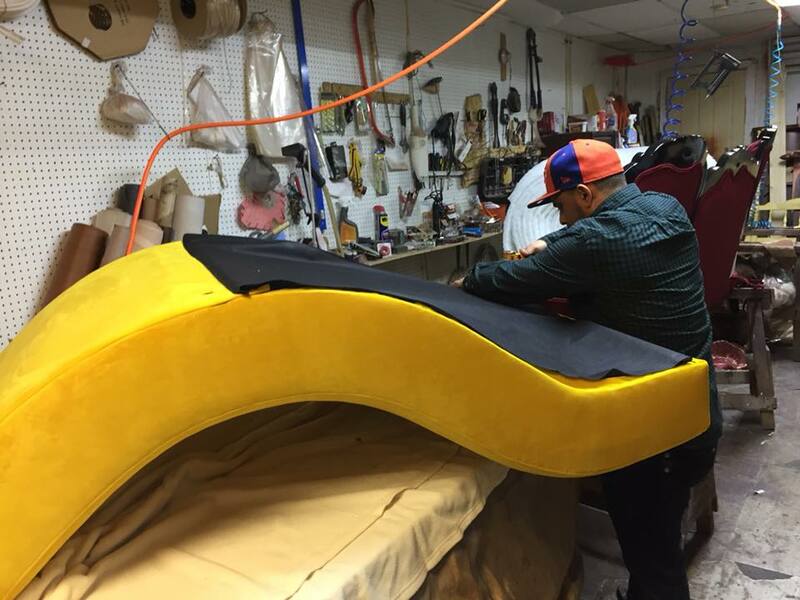 The Upholsterer works to add the dust cover, the final finishing touch! You can see in the background he does some amazing pieces and I have seen him working on more than one Victorian piece. They always look fabulous! Meanwhile, I was at home working on the legs. They were pretty nicked up, had a bad repair on one of them and were in need of a fresh start. I sanded them down, did some repair work on the bad repair and then gave them stain and poly top coat. The final detail was all new floor glides. The final result is a stunning piece with all new guts and a total fresh start. My client is looking forward to relaxing with a good book and I would be lying to say that doesn't make me a bit jealous! Sorry about my living room as the background.....it was so rainy this weekend I just could not get any decent pics in natural lighting outdoors, which is my favorite place to photograph. The color is stunning as well!!! Such a fabulous accent piece that will steal the show! The tufting adds so much to this larger piece. It really needs some details to break up the piece visually. If you search for this piece on an image search, you will see them done in many ways. I enjoy the tufted pieces best and ones with thicker foam like this one. Overall, the finished price of this piece is well under retail in my markets. Had I taken this on myself and invested my own money into the restoration, I would have priced it accordingly. However, I was able to save my client money and she was able to call the shots on the important things like fabric selection and stain color. I guess with any restoration you have to have a bit of flexibility on the final product, but generally, that's my job to pull the details together and present a gorgeous finished product you can enjoy for hopefully the rest of your life! The pieces I select for restorations are always something with significant design or collectability status but in reality, the sky is the limit if you are willing to invest in the piece. I will be looking to pick up some more Pearsall items shortly that will all need complete restorations and I would love to coordinate restoration on them. Please keep me in mind when you are looking for something for your home! I would gladly source something for you that needs a makeover and follow through the process with you, advising you along the way. All custom restorations will require 50% deposit to start the work. If you have me purchase your fabrics for you, I will offer you my wholesale rates as well. Fabric is a tricky thing but I do have some sources for discounted close outs as well. It can be overwhelming! Definitely order a current JOYBIRD swatch kit before you start your search! This week I found a sale at Norwalk Furniture at $8/9 a yard for closeout fabrics they had available. I bought 15 yards of an orange I have earmarked for my Pearsall couch coming! $100 for 15 yards is INSANE! Even if I have to have the strapping and structure redone by the upholsterer, I will still be well under retail on the piece. And since it will be going in my own living room, this excites me a lot! hahaha You can see my current sectional in the pics above and I am so over it!!!! My husband loves it and has fought me about replacing it. I finally found a large 9' couch that I think will be great and we will even have room for a chair! <3 Here is the link to the NORWALK FABRIC SALE. Norwalk, by the way, had some great Mid Century offerings back in the day! They are still manufacturing furniture today! These cuties will be available to customize shortly! I also have a quote for the X benches that are going to be redone. I need to disassemble the second one which is extremely labor intensive. Once I get that done (shooting for spring) they will be ready to head to the upholsterer. I loved the fabric on the wave lounger so much I am thinking of staying with it.....possibly blush...but there is a great moss green too. If you are interested in having me customize them for you, please reach out before I get started. Final pricing on them will be in the $700-800 range depending on if bought direct or through one of my online markets. They will be amazing at the foot of a bed. I am thinking they need some tufting up top as well, so will be running with that! Other quick notes: The gold tufted couch/chair set is off the hook. It is currently in 6 shopper's carts on etsy. I have quoted shipping to California (from PA) and checked my plycon rates in the chairish shop. This set is going to cost $500-1000 to ship. Seriously. I need a regional buyer for this set unless you have a fat shipping budget. I will drive far to find it the right home, but you would need to reach out so we can talk about it. I prefer NOT to split the set. The chair by itself to me is not really worth selling on it's own and honestly, I priced the set LOW on purpose.....like throwing the chair in for free anyway and factoring in the wear on the arms. If you are considering the set, reach out! It is a beautiful set and very current with what is trending. I do think you can match the velvet you could have some arm covers made up to cover the wear. A quick check on etsy confirms that there are MANY options for useful and decorative arm covers! Plus I found someone selling velvet that may match. That is really the worst of the issues. I can help you with that if you would like. ALBUM SALE on my facebook page is still going on! Grab some goodies from my wholesaler, Primitives by Kathy AT COST! That's right! I am selling a bunch of cute gift items at my wholesale price! Sure, they aren't everyone's style, but they make great gifts for mother's day, easter and more! Please stop by and check them out at facebook.com/madformodmalissa. The album is pinned to the top of my wall. I will send you a paypal invoice with shipping added. Fill a box! Click the link above to visit! Thanks for popping in! I have noticed an issue with my mailchimp list and it appears that some email followers MAY have been added without their consent. This seems nuts to me as not only do you need to complete the form on my website, you then need to follow through and respond to the email they send you to confirm you really want to be there. I do not randomly add anyone to this list! Not my friends, not my family, not even people who follow me on facebook. SO, with that said, if you got on my list without your consent, please contact me via email! Mailchimp seems to be spamming people and it makes me mad. So I apologize if anyone is getting my updates that did not sign up for them! Hen On Nest Collection up for sale. 3" and under SALT CELLARS selection. They are so cute! Make sure you check out the video above to learn about them and I discuss condition issues, etc. If you are new to vintage glass collecting, you might find some information of interest about the makers and markings. Stay tuned to my social media for more listings. If you aren't following me, here is the run down! Many times, my updates will hit there first. Also, keep in mind that not all FOLLOWERS see all of my posts! If you don't want to miss anything, make sure you select to see all posts on Facebook! NEW ITEM! Herman Miller Eames Aluminum Group SOFT PAD executive arm chair featuring swivel reclining seat, casters and beautiful COBALT blue fabric is really good condition! Very comfortable making a classic bold statement for your home or office! Available NOW in my etsy shop....click pic to go there, and almost live in my chairish shop. should you require white glove delivery. GREYHOUND BUS SHIPPING AVAILABLE ON THIS ITEM! Reach out for more info! The day bed cushions and fabric have been dropped off at the upholsterer and will be completed in the next few weeks. All new foam plus the gorgeous navy blue PET and KID friendly fabric from Joybird. I cannot wait to see them all done. In the mean time, I will do some touch ups and clean up on the metal and wood frame. I do not have the final priced worked out yet, but if you are interested in having first dibs on the finished piece, please reach out and you will get the first information when it is ready! I have selected the rocker base for the black fiberglass (Summit Production) Herman Miller Shell with black vinyl upholstery. It will be receiving a ZINC base with NATURAL BIRCH runners. I think the lighter wood and metals will set off the black on black nicely. I will be replacing the missing Shock Mounts and have parts and supplies on order with Modern Conscience which will be coming with the base in the next week. This one (along with the other finished RAR I have available) will make a FABULOUS holiday gift for that special someone! I will also be posting updates on these restorations via my social media outlets so jump on in if you'd like to see them coming along. You may think we are far away from the holidays, but in reality, they are coming quick. Please note that any items shipping via GREYHOUND BUS will take about 2 weeks to go cross country. Please keep this in mind when you are ordering gifts or items you plan to use for your holiday décor! I do my best to get most items packed and shipped within 24-48 hours but delivery time frames are definitely out of my control. PICK UP of any of my online items can be arranged WED-SUN 10-6 at my booth space at FLEETWOOD ANTIQUE MALL 14129 Kutztown Rd, Fleetwood, PA 19522. My day availability for deliveries currently is TUESDAYS, WEDNESDAYS and FRIDAYS. I will gladly meet up or deliver furnishings in the Philly Metro, central and eastern PA, NJ areas and maybe beyond. Please reach out to discuss! If I can do anything to make your gift giving extra special, please ask! My priority is safe shipping so sometimes it is not possible for me to wrap your items, but I would gladly enclose a card or ship directly to your recipient!